Your New Go-To Holiday Appetizer! So these little gems come straight from my cousin, Katrina! 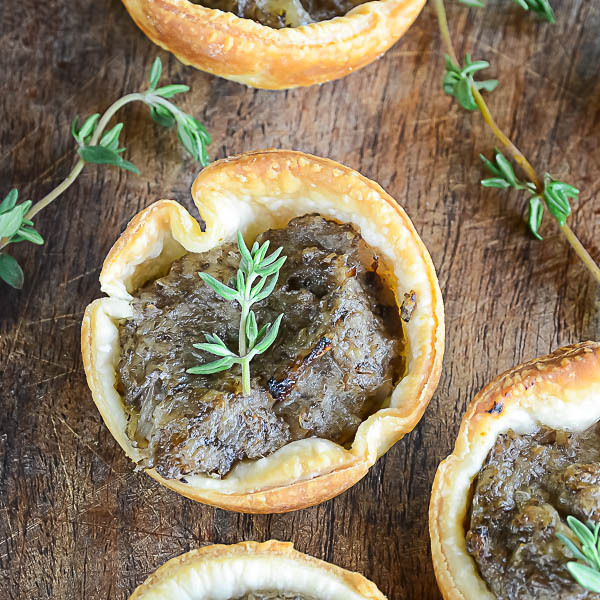 Since we’re deep into the holiday entertaining season and everyone needs a savory one-bite wonder to offer at festive occasions, I thought this would be the ideal time to share her savory mushroom tartlets with you. Katrina makes these every year and they are an overwhelming hit with family and friends. I know your brood will enjoy them just as much – but I should warn you, they go down so easily (with a cocktail or a glass of wine, ahem), it’s very easy to spoil your dinner – or rather, just make them your dinner. No judging here. 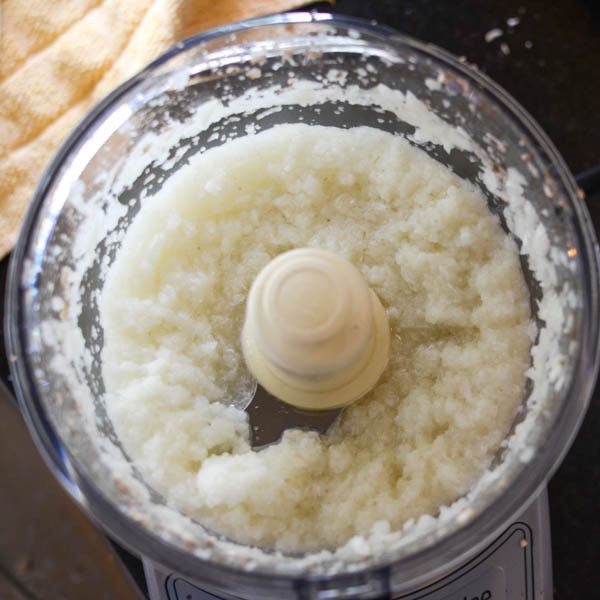 Best of all, they’re really simple to assemble — especially if you’ve got a food processor. Buzz the mushrooms to a very fine chop and saute them with butter, cooking just until they give up their liquid. Then whir the onions the same way and add them to the mushroom mixture. Roll out the pastry and use a small biscuit cutter to cut the rounds so they cover the bottom and sides of a mini-muffin pan. Then scoop the mushroom duxelles into the shells. Here’s the absolute genius part of these tartlets: They can be made ahead of time and frozen. So whenever you want them, whether it’s for a big party or just a small gathering, take out what you need and reheat them. I love that! I have to thank Katrina for sharing her recipe and letting me hang out (and sample) her creations as they were coming out of the oven. These tasty tarts can be made in advance and heated just before company arrives. They're great with a cocktail! In a large bowl, beat together the cream cheese, flour and butter to form a dough. Chill for one hour. In a skillet over medium high heat, saute the mushroom and onion in the butter until tender. Add sour cream, salt, thyme and flour and stir to combine. Cook for one minute, remove from heat to cool. On a floured surface, roll out the dough to about 1/4" thick. 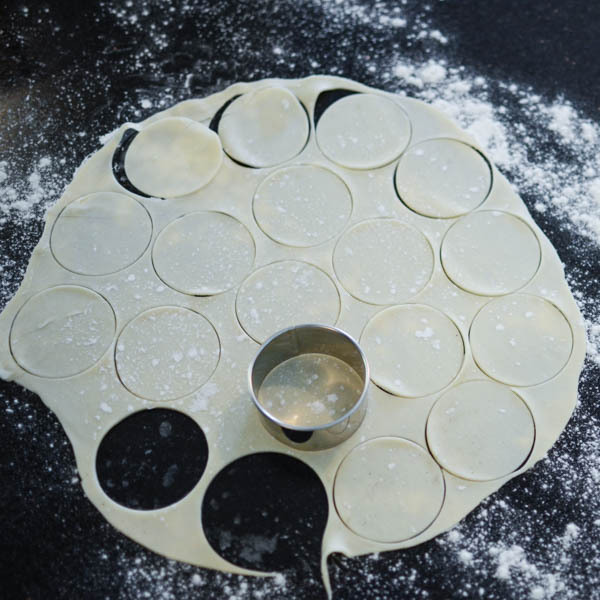 Cut the dough into rounds with a biscuit cutter, about 2" in diameter. Fit the dough rounds into mini muffin tins and lightly tamp them into place. Fill the tarts with 1 teaspoon of mushroom filling. Bake 12-14 minutes. Serve immediately or if you're making ahead of time, cool to room temperature. Place on a baking sheet and freeze until solid. Transfer the tarts to a storage container and freeze for up to a month. Defrost and reheat to serve. - Beat all ingredients until smooth and chill for at least 1 hour. - In a skillet cook butter, onion and mushroom until tender. - Then add sour cream, salt, thyme and flour. - Cook for about a minute until thickened and cool. - Roll out the dough and cut into 2 3?4 in circles (or thereabouts) and place into a mini muffin pan. - Bake at 450 degrees F for 12-14 minutes or until the crust is a light golden brown. Going to try these for my upcoming Christmas party! How do suggest reheating them if made in advance and then frozen? On the day you want to serve them, take them out of the freezer about 1 hour before popping them in the oven, so they thaw before baking. I would heat at 300° for 10-15 minutes. These little morsels are high on my list to try for the holidays. I love mushrooms and these sound soooo savory. Oh, these are definitely a hit at any party! These look so good Lisa!!! And thanks again for all your help!! I so appreciate it!! So, to make this GF, I have pastry, but the thickener in the filling? what would you suggest as a substitute? Perhaps potato flour? That sounds amazing. I’ve shared my recipe — now you have to share yours! These looks so delish and savory. Great for putting together for a large crowd too! Got any large crowds coming? Love the idea so much! pinned! this looks like a delicious appetizer!! I love mushrooms. Like, LOVE mushrooms. I can’t wait for my next social event so I can make these!! I’m a huge mushroom fan too! Thanks for the tutorial and the samples! Yum!